Chicken is a healthy option when you're looking for a lean protein. 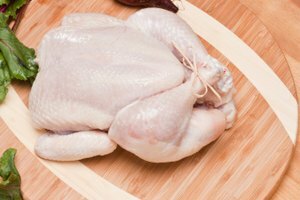 As delicious is is its to eat, it's very important to clean a chicken properly before cooking and serving it because the juice from it can contaminate other foods. This can happen by direct contact or by using the same utensils with the chicken that you use with other foods without washing them between uses. This is why it's also important that you wash your hands before and after handling raw chicken as well. Follow these easy steps to make sure you're taking all the proper precautions. Remove the bird from its packaging and remove the packet of giblets from the chicken's cavity. Place the giblets in the refrigerator. You'll need to use them within two days or dispose of them. Examine the bird to see if the kidneys are still intact. You can tell by looking in the abdominal cavity. The kidneys are dark red in appearance and are located in the back portion of the chicken. If they are still there, you can simply remove them with your fingers. Rinse the chicken with cold water under a tap in the kitchen sink. Make sure to rinse the inside and outside of the chicken. Pat it dry with a kitchen towel. Drying it will give it crispy brown skin when cooking. 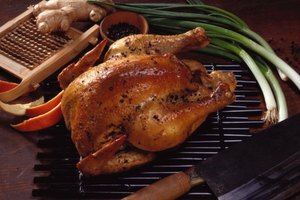 Once you have finished cleaning the chicken, scrub any surfaces and utensils it has touched with hot soapy water. This will prevent bacteria from contaminating any food.